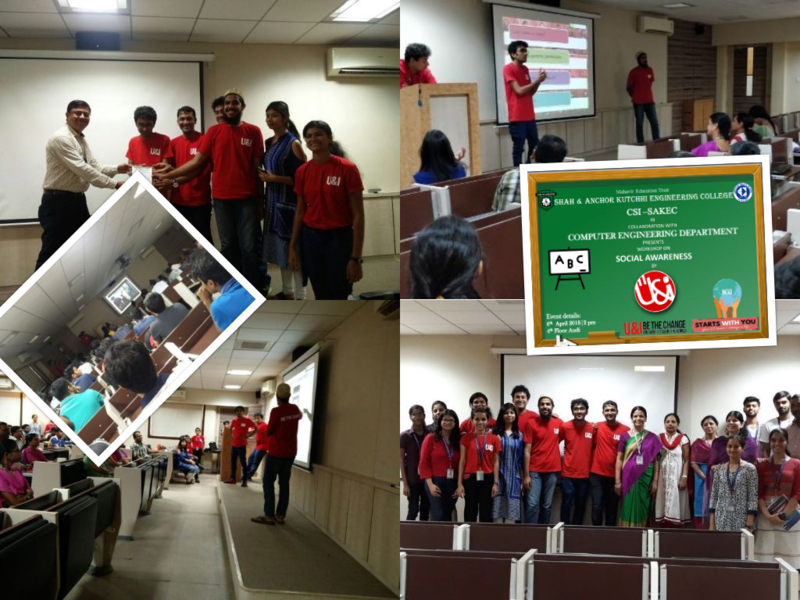 SAKEC-ACM in collaboration with Computer Engineering Department has organized “SAKEC-CONNECT” on 29th and 30th March 2019. It was tech competition for undergraduates where they participated as individuals. Based on skill sets of individuals a team of 4 has been formed to develop any software product. Mentors are also assigned to guide all the teams. The judges have chosen the top 3 teams who are winners. 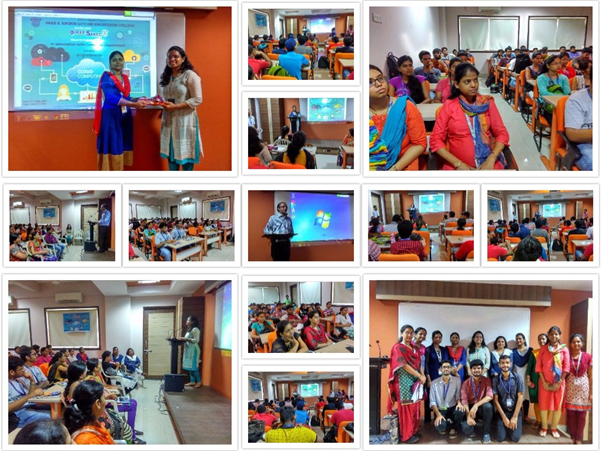 PiXEL 2019, Tech Conclave organized by the Computer Engineering Department of Shah & Anchor Kutchhi Engineering College, on 26th March 2019. 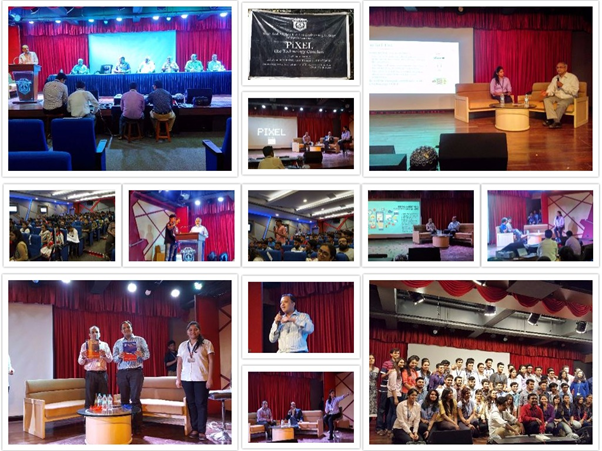 It witnessed experienced professionals coming together and discussing with the students about the stories of their journeys as triumphant technocrats, entrepreneurs and dynamic personalities. The event started on with the PIXEL team cordially inviting all the guest speakers and dignitaries. The spectacular line-up consisted of Mr. Vivek Singh (Blockchain Technical Advisor at Hyperion X) on BlockChain , Mr. Dhruva Mota (Founder & Game Developer at CTRL F5 & ELEMENTAL GAMES), Mr. Viral Vora (Founder & Game Developer at CTRL F5 & ELEMENTAL GAMES), and Mr. Aditya Mule (Senior Game Developer at Gametion) on Game Development, Mr. Kushal Sankhe (Co-Owner at Blanco, Bombay Cocktail Bar), Ms. Amreen Luthra (CEO & Founder of Amreen Luthra Training System) on Entrepreneurship, Mr. Sankalp Mate (Cyber Security Analyst at Pristine InfoSolution Pvt Ltd.) on Cyber Security, Mr. Harsh Vitra (Founder at Enroot Mumbai) on Code in X and Mr Kunal Pandit (Singer) & Mr Vinayak Patil (Super Vinay) as our Influencers. This immensely successful and impactful event was managed and co-ordinated by team PIXEL, who put together a memorable and brilliant show. 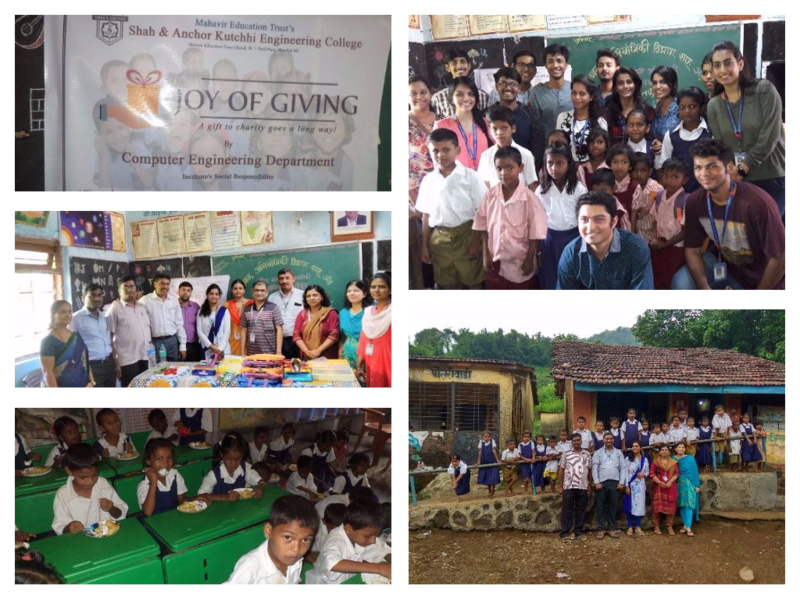 As a part of Institute’s Social Responsibility, Computer Engineering Department of SAKEC, along with few faculties and students has visited Zilla Parishad School in small village of the Raigad district on 25 th October 2018 and spent their day with the school students. The joy we witnessed on their little faces as they welcomed us with smiles was wonderful. Excitement ensued when the goodies were distributed to these kids. Enthusiasm among our volunteers as they interacted with the students of the school was also palpable. There was a marked happiness among all the staff and the feeling of joy was apparent all around. It was indeed a humbling and memorable experience to hear these kids out and spend time with them. on 16 th February 2019 as a pre-event of CSI Mumbai TechNext India 2019. The workshop was conducted by Dr.Yogendra Pal, Project Research Scientist, IIT Bombay.  Explain the need for different types of educational videos.  Select the appropriate type of educational video for a topic.  Use presentation software effectively to create presentations for screencasts.  Use Open Shot software to edit educational videos.  Setup his/her studio for different types of educational videos.  Explain various hardware that can be used to produce educational videos.  Apply best-practice in MOOC creation and running. The participants were immensely benefitted by the workshop. 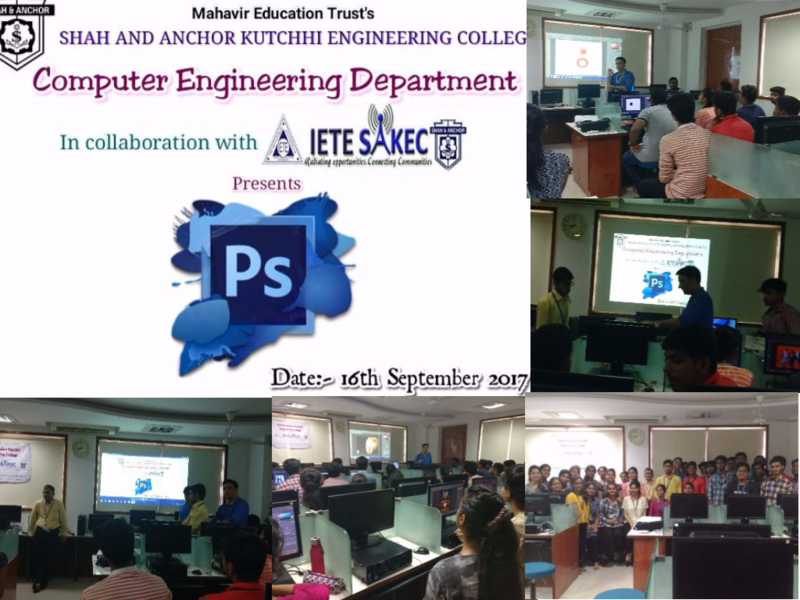 Computer Engineering Department of Shah and Anchor Kutchhi Engineering College conducted an Alumni Talk on 4th October 2018 . 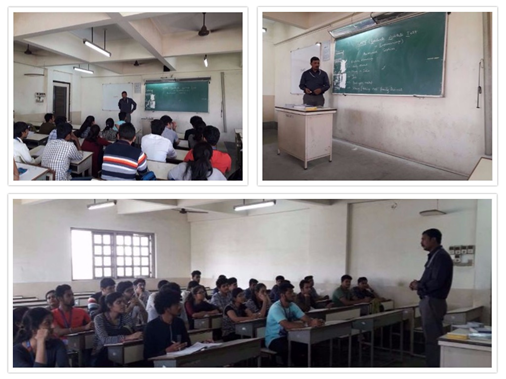 Mr. Akshay Deshpande was invited to guide the students about Technical skills needed for corporate job. He shared his experience and valuable knowledge with them. Session was very interactive as well as informative. This event was coordinated by Ms. Vidyullata Devmane. 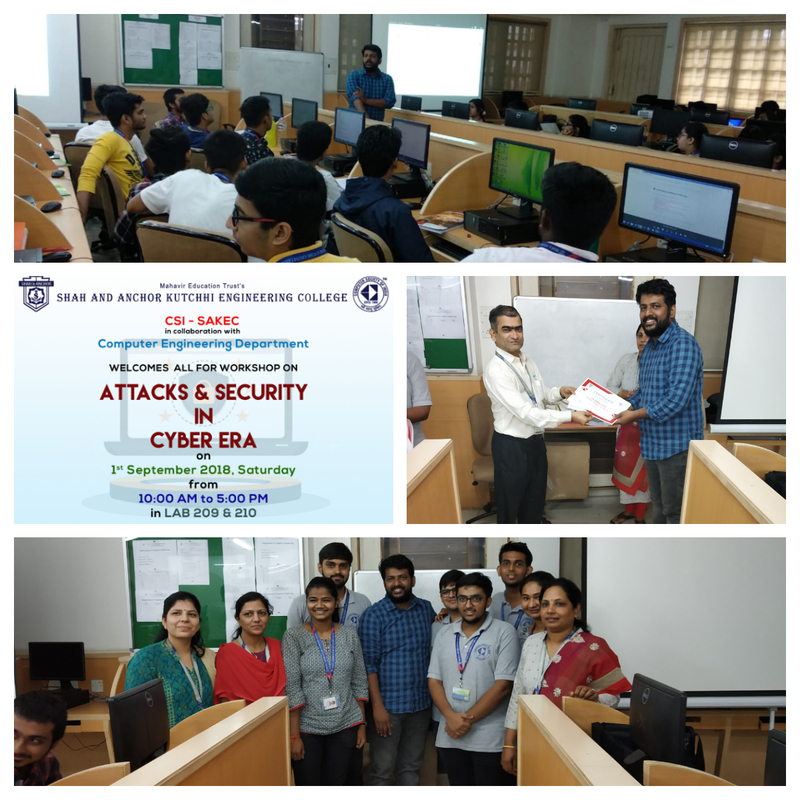 A workshop on Attacks & Security in Cyber Era was held on 1st September 2018 organized by CSI-SAKEC in association with Department of Computer Engineering #SAKEC. Speaker of the event was Prof. Saurabh Patil who has conducted more than 70 workshops on Security. Topics covered in the workshop were a demonstration of Linux attacks, Email Spoofing, Flooding Attack, Websploit Attack, Metasploit Attack for Windows System, WIFI-Attack and Android Phone hacking. 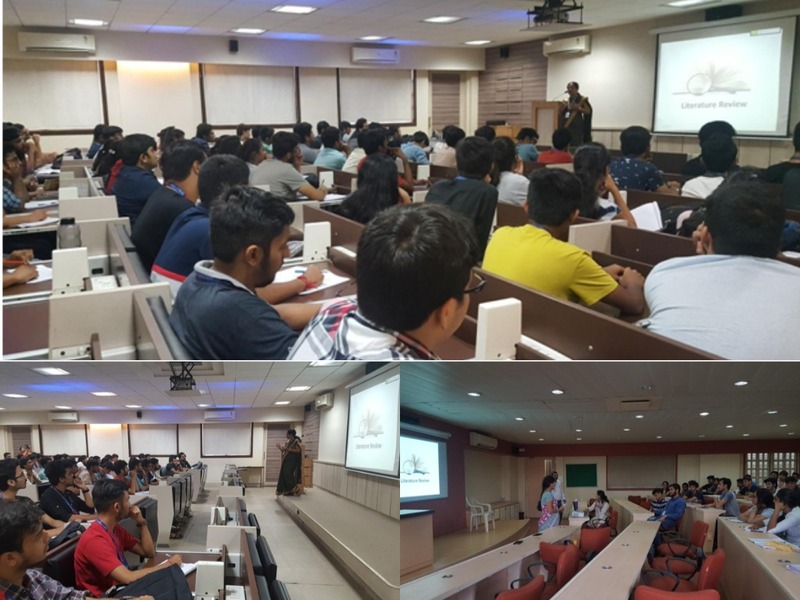 A workshop on Tensorflow Framework for Mining was held on 11 th August 2018 organized by CSI-SAKEC in association with Department of Computer Engineering #SAKEC. Speaker of the event was Aakash Shah a student of Final Year Computer Engineering. Topics covered were Installation on Anaconda Framework. Designing of basic Deep Learning Model simplified by using TensorFlow. Creating, Retraining and Evaluation of the Image Recognition Model using TensorFlow. The event was a great success ending with a smile on the faces of the participants. ISTE SAKEC in collaboration with Department of Computer Engineering organized an workshop on MATLAB on August 1, 2018 in Lab 209 and 210. The speakers were Prof. Deepti Nikumbh and Prof.Rekha More. 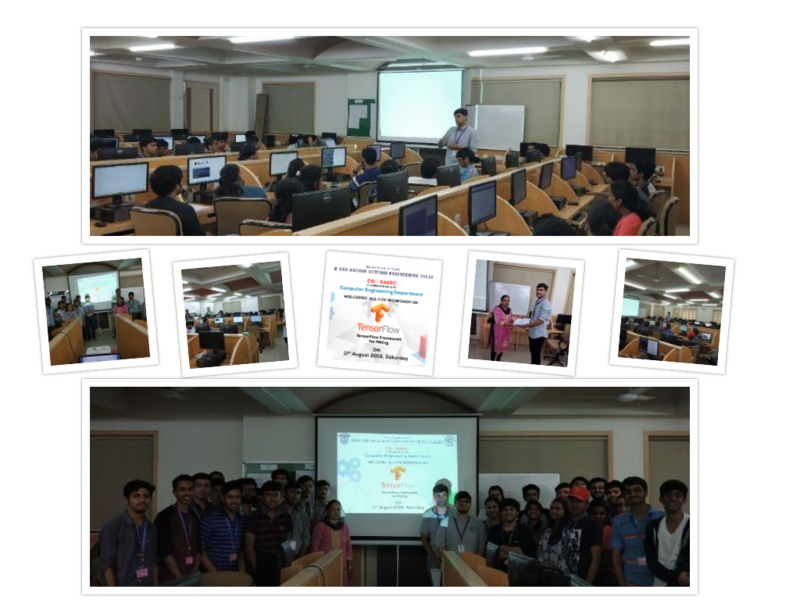 Participants learnt many things like Features of MATLAB, Starting and Using MATLAB, Creating Graphs using plots tab in MATLAB,2D and 3D graphs and reading and playing Audio files in MATLAB. 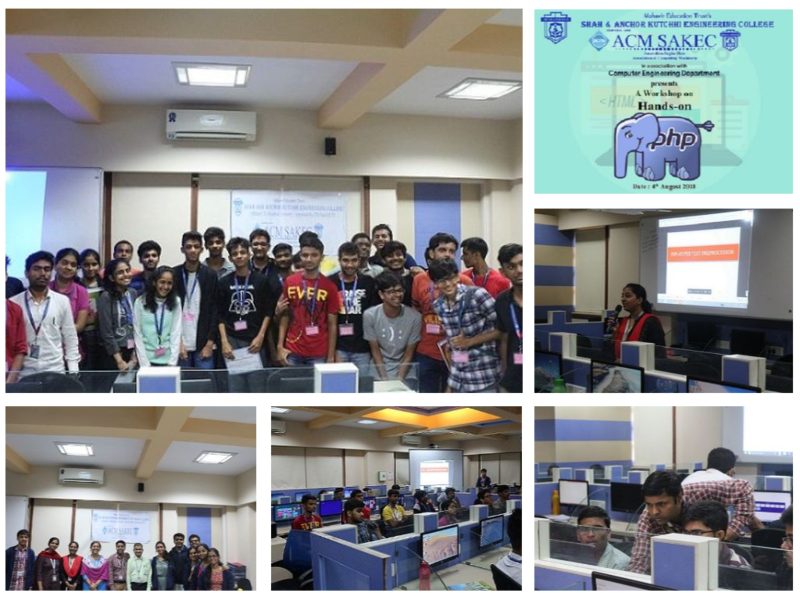 A workshop on Hands-on PHP was held on 4 th August 2018 organized by SAKEC ACM student chapter in association with Department of Computer Engineering, SAKEC. Speakers of the event were Prof. Jaya Zalte and Prof. Pradip Mane Assistant Professors from Computer Engineering department. Topics covered were Introduction to PHP, data types, variables and constants, conditional and looping statements, functions and arrays, PHP forms, transferring information between PHP pages, PHP sessions, database fundamentals, getting PHP to connect to MySQL, querying MySQL using PHP and building a web application. The workshop ended with positive feedback from the participants. 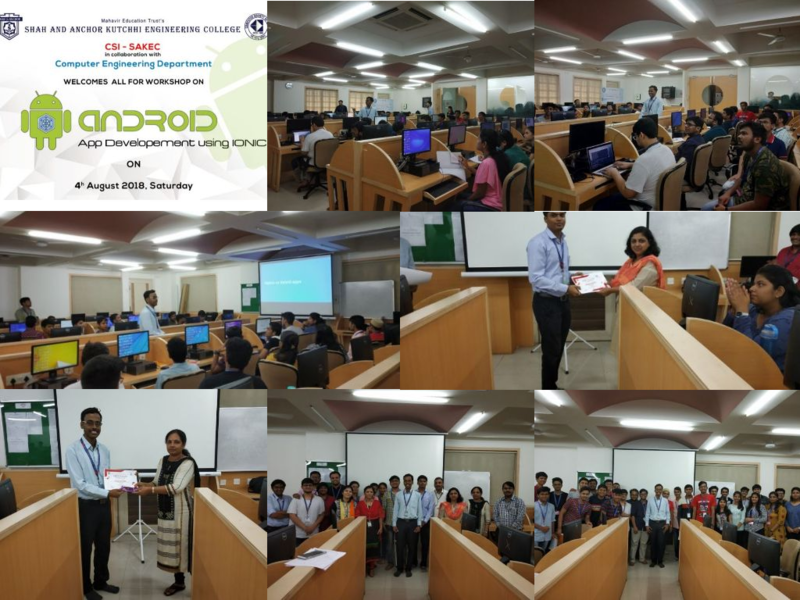 A workshop on IONIC Framework was held on 4 th August 2018 organized by CSI-SAKEC in association with Department of Computer Engineering #SAKEC. Speaker of the event was Vivek Gawande a student of Final Year Computer Engineering. Topics covered were Ionic installation, HTML/CSS, Basic operation in Ionic, Creating App using Ionic framework. The event was a great success ending with a smile on the faces of the participants. 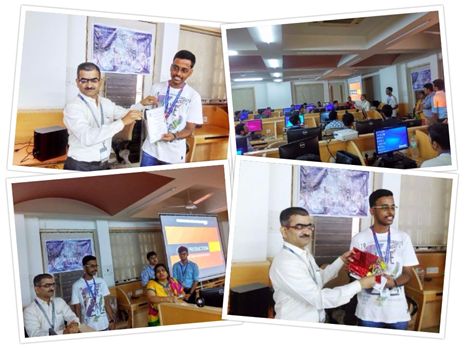 Computer Engineering department had organized a Student Development Program on “How to do Literature Survey” for Third Year students on 24th August 2018. Dr. Rekha Ramesh presented a talk to TE3, TE4 class students and Prof. Pinki Vishwakarma to TED class students on importance of B.E. project, publishing a paper related to project, decide keywords of area of interest, searching papers, reading papers using three pass, the importance of citation, the harms of plagiarism, impact factors, different phases of writing and reviewing a paper. 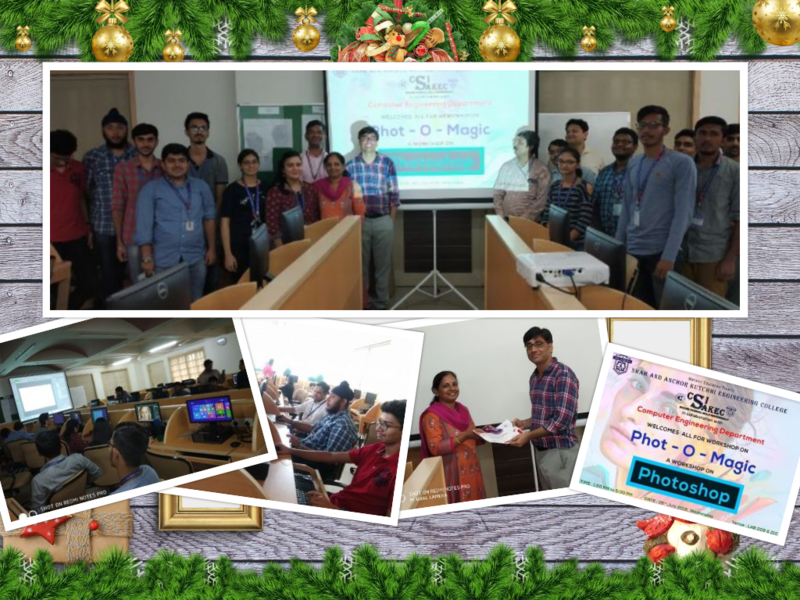 A workshop on PHOT-O-MAGIC was held on 25 th July 2018 organized by CSI-SAKEC in association with Department of Computer Engineering #SAKEC. Speaker of the event was Prof. Prakash Parmar. Topics covered were basic tools of Adobe photoshop their information as well as usage of Filters, Image manipulation, variable usage, photo and certificate editing. 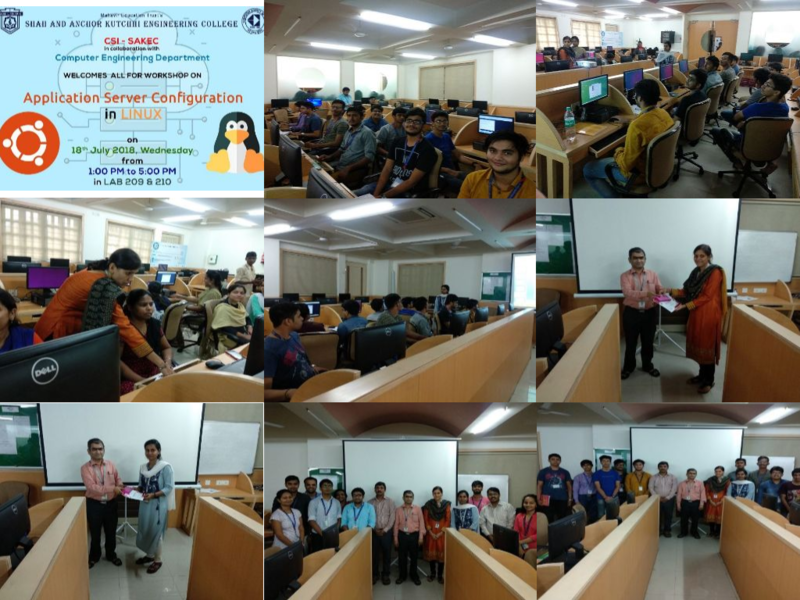 CSI-SAKEC in association with Computer Engineering Department organized a workshop on Application server configuration in LINUX on 18th July, 2018. Speakers of the event were Prof. Shilpa Kalantri and Prof. Vaishali Hirlekar. Topics covered were Linux basics and networking commands, configuration of IP Address in Linux environment, Installation and configuration of remote login server (TELNET and SSH) and Installation and configuration of public and private FTP server and file transfer. The workshop ended with great feedback from students. 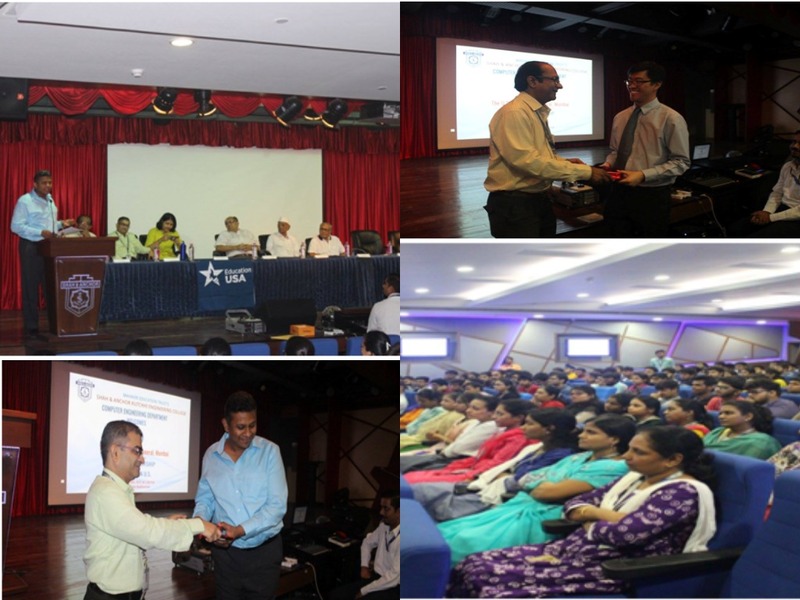 CSI-SAKEC in collaboration with Computer Engineering Department had organized a workshop on “Social Awareness”. 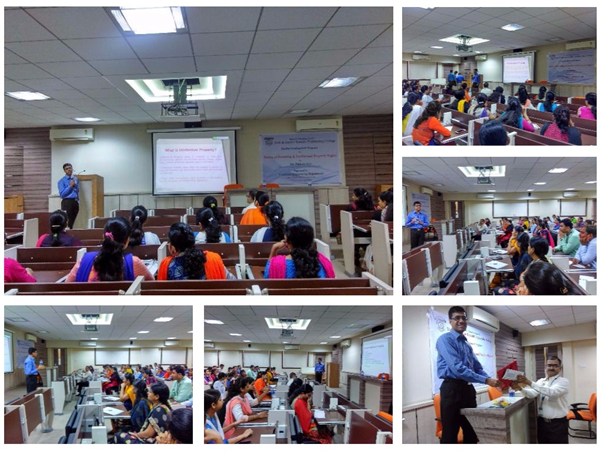 The workshop was conducted by U&I team on 6 th April 2018, 2:00 PM to 3:00 PM. U&I is a volunteer driven NGO, that focuses on educating children. The students were made aware about the part of the society where children don’t get education they deserve, and how the youth can help in bringing the change. Pixel 2018,Tech Conclave organized by the Computer Engineering Department of Shah And Anchor Kutchhi Engineering College, on 4th April 2018. The event was sponsored by the V-trans group and Pharmeasy. 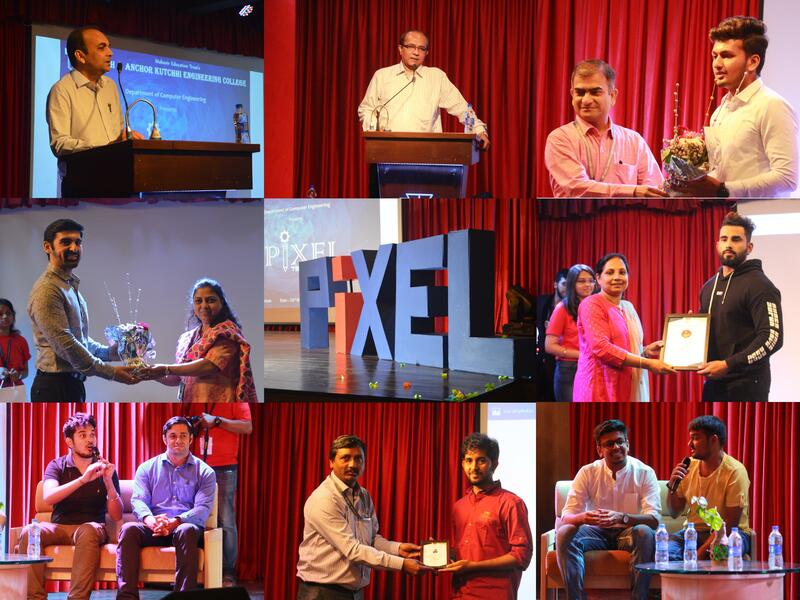 It witnessed experienced professionals coming together and discussing with the students about the stories of their journeys as triumphant technocrats, entrepreneurs and dynamic personalities.The event started off with the PIXEL team cordially inviting all the guest speakers and dignitaries. 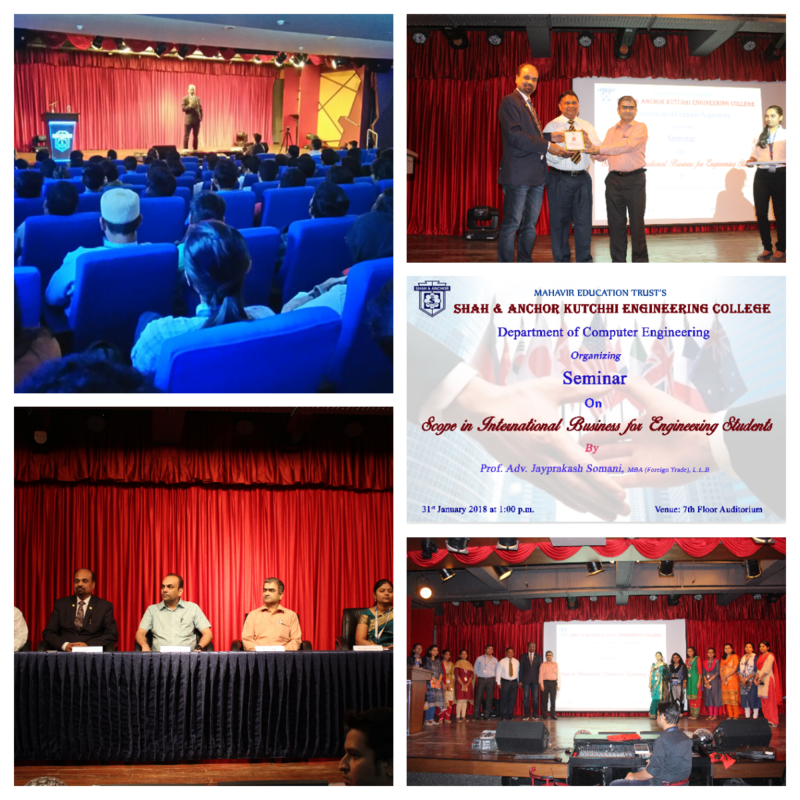 The spectacular line-up consisted of Ms.Shilpa Karkeraa(Founder of Myraa Technologies) and Mr. Avinash Goje (Technical Head – Myraa Technologies), Mr. Bhushan Trivedi (Founder- Piconergy), Mr. Rupesh Sawant (SAP analyst), Mr. Ali Mustafa ( AI & Machine Learning Enthusiast), Mr. Ashok K. Shah (Chairman- V-trans) and Mr. Sanjay Pandita (Motivational Speaker).This immensely successful and impactful event was managed and co-ordinated by team PIXEL, who put together a memorable and brilliant show. 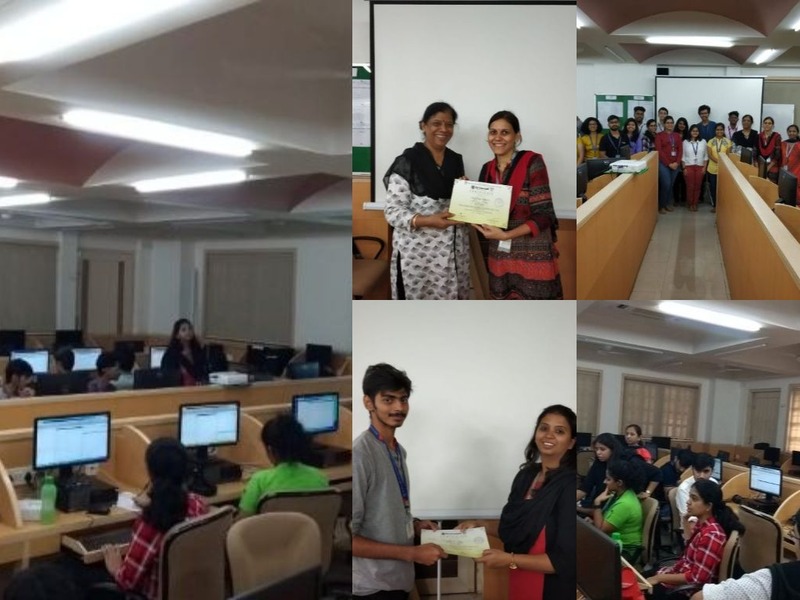 CSI-SAKEC in collaboration with Department of Computer Engineering was organised a workshop on “Angular 4” on 24th March 2018, It was conducted by Ms. Shilpa Jain. Workshop covered the difference between SPA and MPA, different versions of Angular, how to think in Angular, installation guide through Node JS and NPM manager. All about Angular CLI, writing components from scratch and Typescript and different ways of data binding. The primary objective of this workshop was to introduce the learners with the Angular Framework. 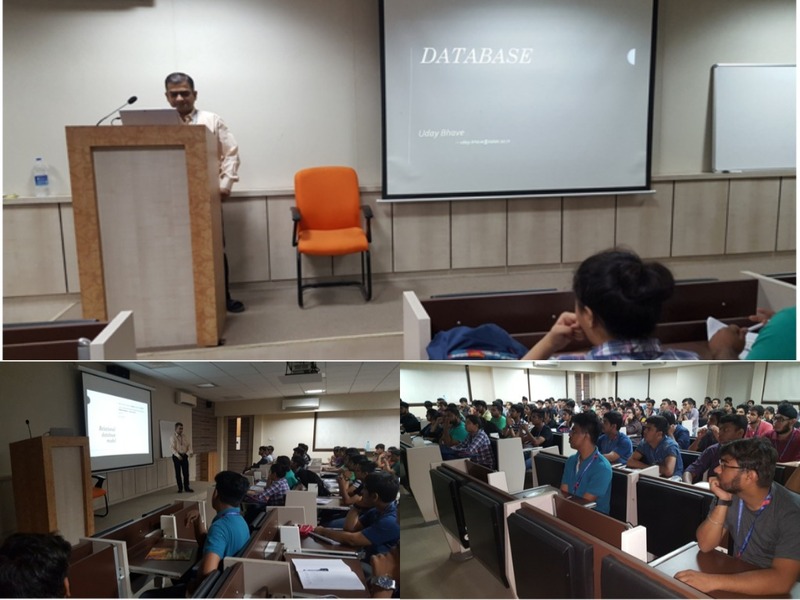 Student Development Program on “Database Design” was organized by Computer Engineering Department on 17th of March 2018 in 4th floor Seminar Hall. The event was coordinated by Prof. Shahzia Sayyad. Prof. Uday Bhave started the program with the fundamentals of database like Data, Database, Database Management System and System and Application Softwares. The concepts of Relational database model were presented with different case studies. The SQL statements that are in the DDL and DML class were also covered. At the end, the students were asked to solve few case studies. Final Year Project Poster Presentation was conducted by Department of Computer Engineering on 21-03-2018 on 7th floor Drawing hall for Third Year students. 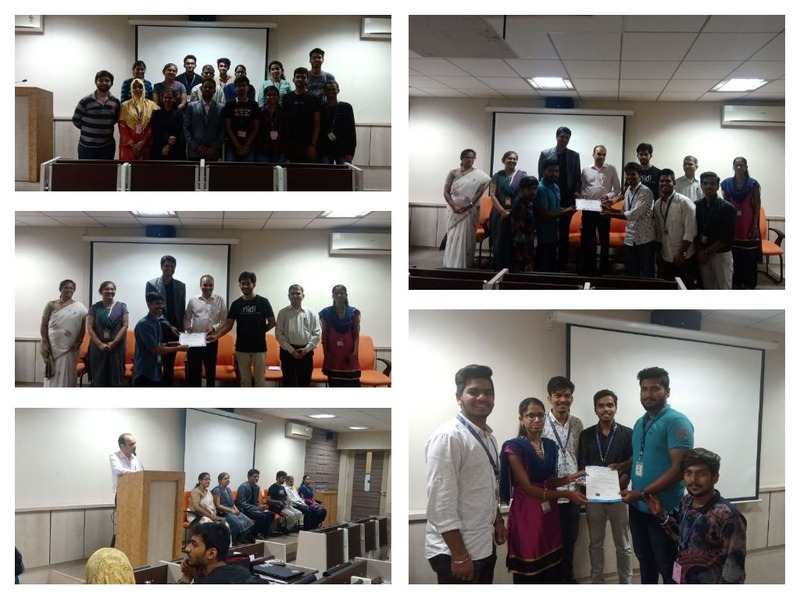 Principal Dr. Bhavesh Patel and Head of the department, Prof. Uday Bhave and many faculties went through the presentations of each group and congratulated the students for their efforts and team work. The posters of projects of different domains like Security, Data Mining, Mobile Communication, Big Data and Networks etc., were showcased. 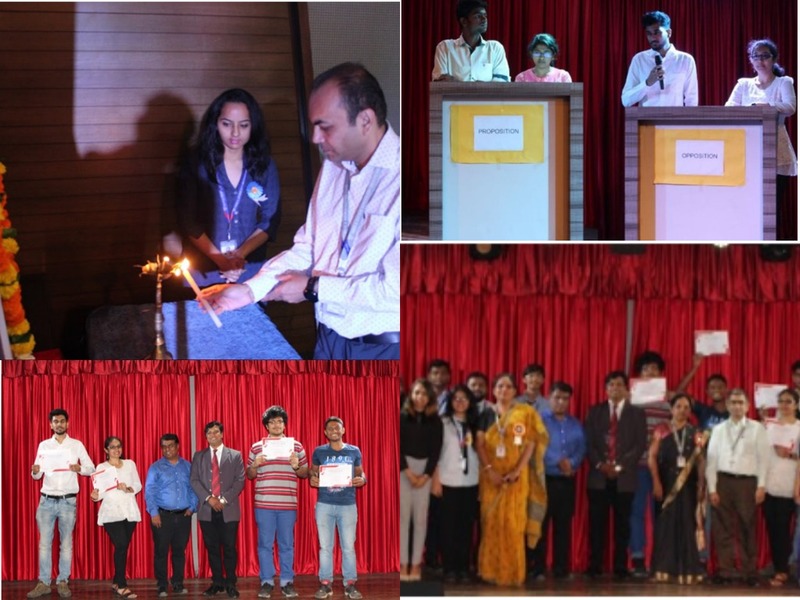 CSI-SAKEC in Collaboration with The Speakers’ Club of SAKEC and Computer Engineering Department of Shah and Anchor Kutchhi Engineering College, organized an Inter_Collegiate Technical Debate, on 3rd Feb 2018, a Pre-Event of CSI_Mumbai , TechNext India 2018. This debate was a Grand Success, with participants from numerous Engineering Colleges and streams. Participants participated in teams of 2. The topics for this debate were technology based. At the SAKEC Technical Debate, SAKEC team emerged as winners, while the Runner Ups were from D.J. Sanghvi College of Engineering. Computer Engineering Department of Shah and Anchor Kutchhi Engineering College has organized a seminar on “Scope in International Business for Engineering Students” on 31stJanuary 2018. The chief guest of the event was Advocate Mr. Jayprakash Somani (Director of Nishant Publications & Marketing Pvt. Ltd. Pune, Chairman of Aaronica Global Exim Pvt. Ltd. Mumbai). Objective of the SeminarThe seminar was intended to introduce the scope of international business for engineering students. 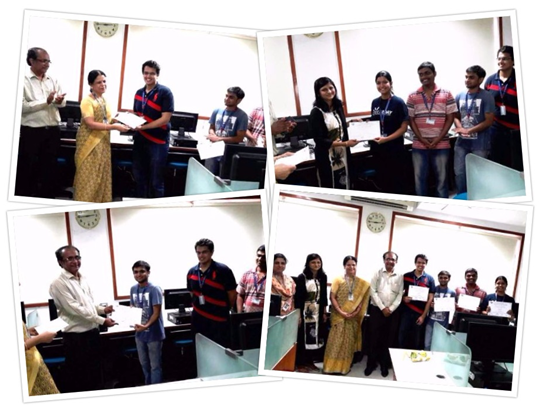 He covered the topic ranges from export & import of systems & services designed by the engineering students. He also gave the first-hand information about the various business opportunities available in the country as well as outside of the country. The main objective of the seminar is to change the mindset of the engineering students from job seeker to job giver. So that students will serve our nation by generating employment for the benefit of the society.The seminar was informative, motivational and inspired students to take up business management in import export. 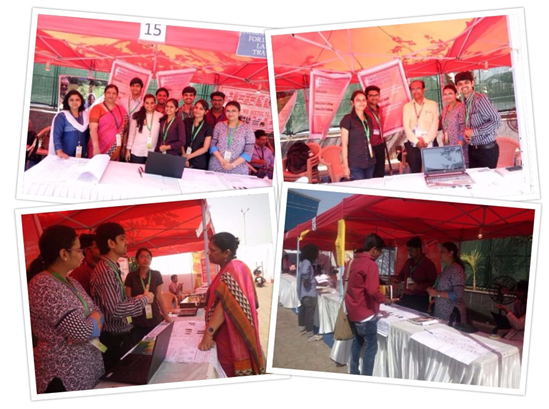 There was tremendous response from the students of all departments. Event was co-ordinated by I/C HOD Prof. Uday Bhave and Prof. PallaviDeshmane. 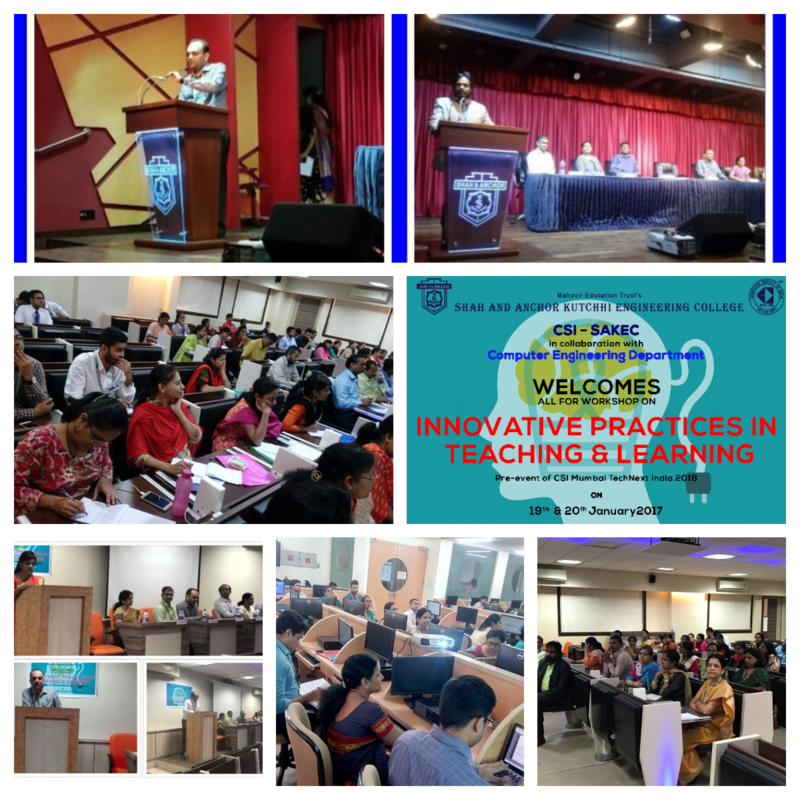 2-Days workshop on “Innovative practices in Teaching and Learning” was organized by CSI-SAKEC in collaboration with Department of Computer Engineering of Shah and Anchor Kutchhi Engineering College on 19th& 20th January 2018 as a Pre-event of CSI Mumbai TechNext India 2018. 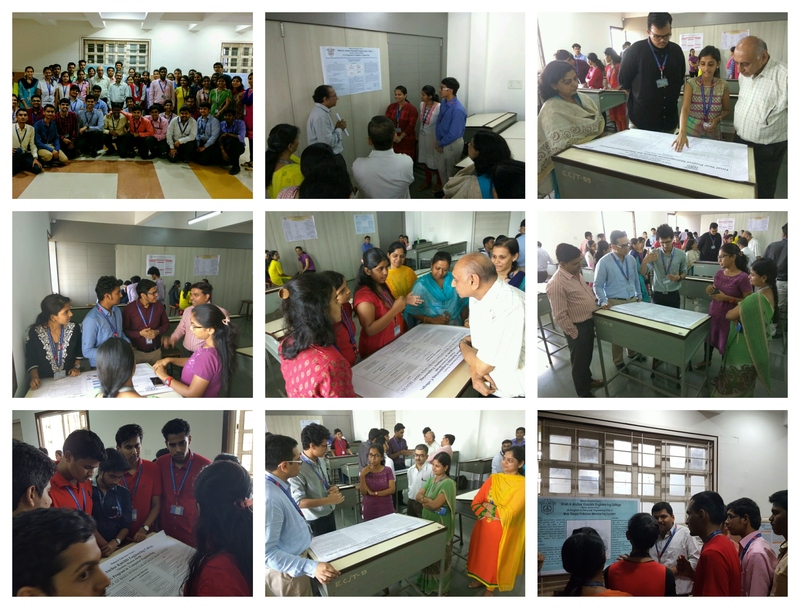 The workshop was conducted by a team of experts from Educational Technology department IIT Bombay, Mumbai. The workshop covered active learning techniques such as Think-Pair-Share, Peer Instruction, Flipped classrooms, Active learning with ICT.Objective of the WorkshopEngineering Education has evolved over the last two decades and has become more student-centric. It has transformed role of ‘teacher’ to ‘facilitator’ with the help of effective teaching-learning practices. The research-based and learner-centered pedagogy for effectively integrating ICT in engineering education plays vital role in this transformation. The effective teaching-learning practices facilitate active engagement of students in the learning process. Such “active learning” strategies require students to go beyond listening, writing notes, executing prescribed procedures. Going further, these strategies make students ‘active learners’ and expect students to work on carefully designed teaching-learning activities that require them to talk, write, draw, solve, collaborate, reflect andexpress their thinking. These “active learning” strategies are explicitly based on theories of learning and are being evaluated repeatedly through empirical research. There has been a strong research evidence in the support of ‘Active learning increases students’ performance in science, engineering and mathematics’. 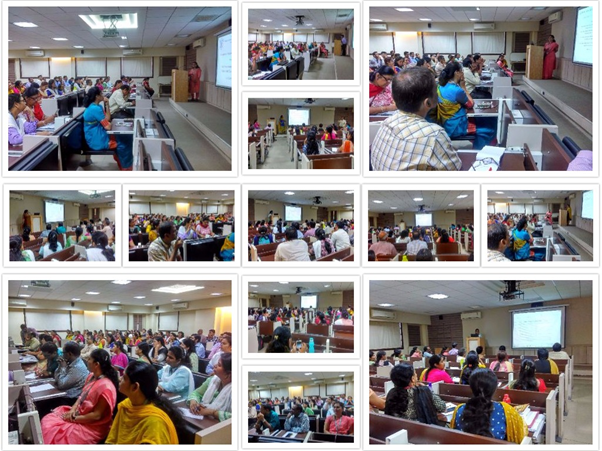 Additionally, the active learning techniques are found to be consistent with Outcome-Based Education (OBE).The primary objectives of this workshop are to introduce engineering faculty to the active learning techniques and to assist them in implementing these practices into their classrooms. Diwali is all about spreading happiness. It is the victory of light over darkness, knowledge over ignorance, good over evil and hope over despair. And in the spirit of this joyous festival, the Computer Department of SAKEC decided to spread some happiness by taking up a small initiative with an aim to bring about progressive difference to the community that each one of us is a part of. 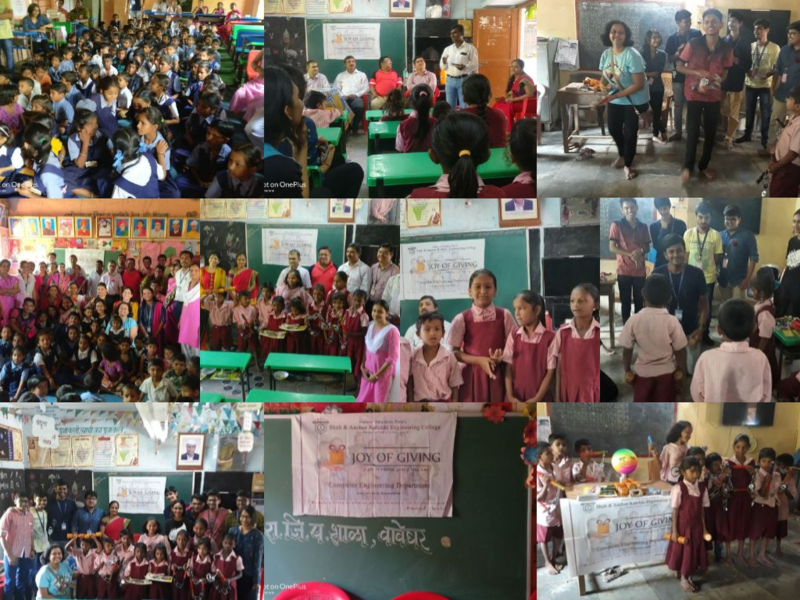 Few of the faculty members of the Computer Department along with some enthusiastic students decided to spread the festive cheer by driving out to Zilla Parishad School in Posari, a small village in the Raigad district and spend their day with the school students. The joy we witnessed on their little faces as they welcomed us with smiles were wonderful. Excitement ensued when the cake was cut and goodies were distributed to these kids. Enthusiasm among our volunteers as they interacted with the students of the school was also palpable. There was a marked happiness among all the staff and the feeling of joy was apparent all around. It was indeed a humbling and memorable experience to hear these kids out and spend time with them! Here are some images of that day. 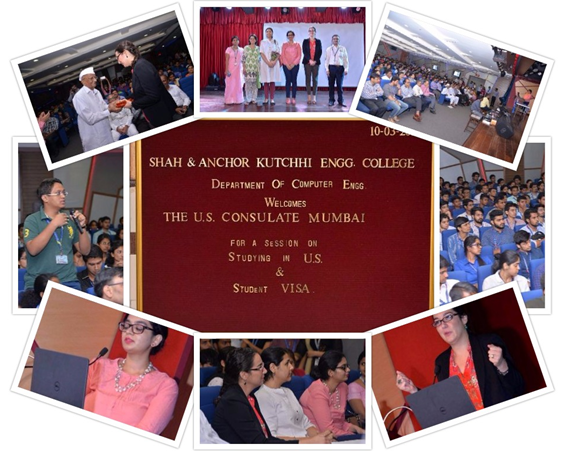 “Entrepreneurship and Studying in U.S.” informative and interactive session was organised by Computer Engineering department at Shah and Anchor Kutchhi Engineering College on 25th October,2017 at 2.00 p.m.
U.S. University alumnus Mr. Rusabh Shah has shared his experience about his entrepreneurial journey, was very encouraging. He talked about how studying in U.S. helped to shape his path to establishing a successful start-up. Assistant cultural affairs officer, Mr. Jonathan, Education USA Advisor, Ms. Tanushka Bali has explained procedure about “How to apply for studying in U.S.” in detail. She has also cleared all the doubts that student has raised regarding the procedure. 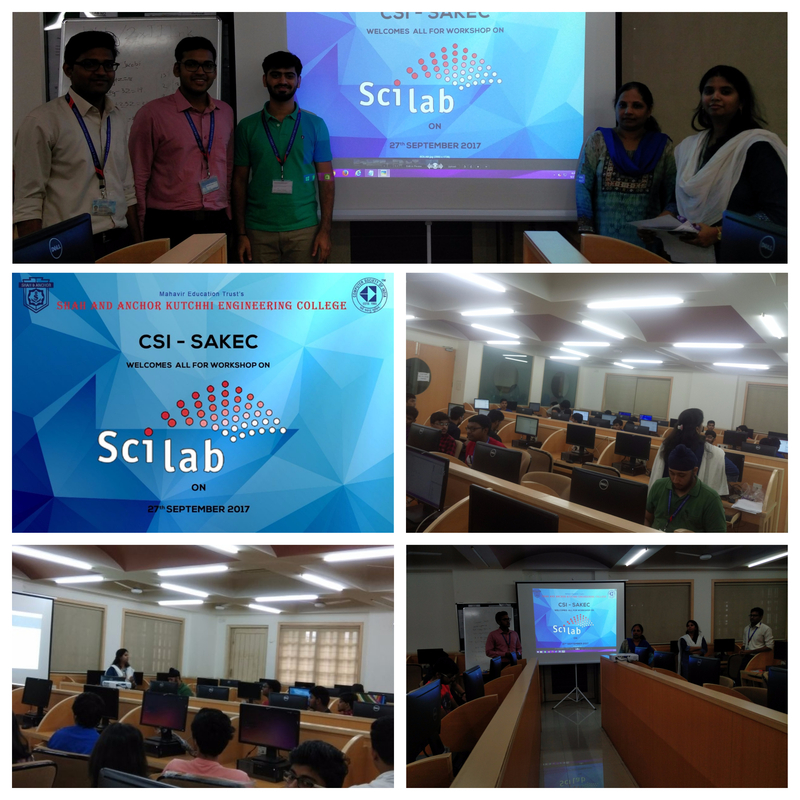 SCILAB workshop was organized by the CSI-SAKEC student chapter. 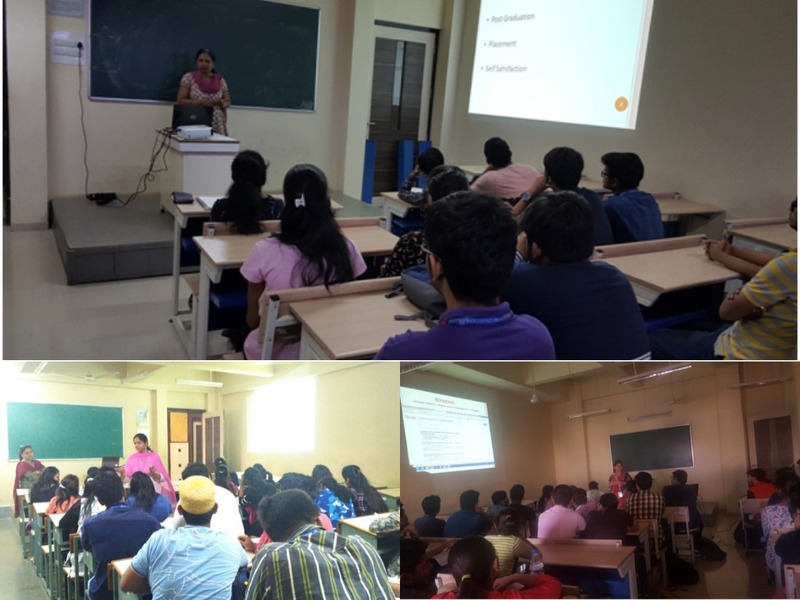 The workshop was conducted by Prof. Deepti Nikumbh of Computer Engineering Department on 27th September 2017 for SAKEC students. The main objective of the workshop was to get the students familiar with the basic introduction to scilab and its use in mathematics. The key features of workshop was to enable participants to use scilab as calculator, Variables and functions, Performing numerical operations using variables, Defining complex number, Performing exponential and. Trigonometric operations on number’s, Solving linear and non linear equations, 2D plotting. The session was very interactive and concluded with Question answer session. 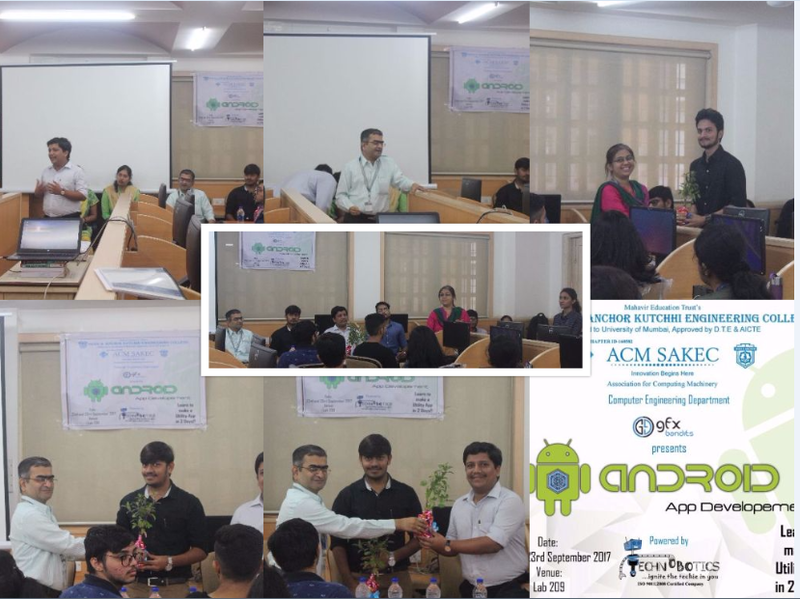 ACM SAKEC in association with COMPUTER ENGINEERING DEPARTMENT and GFXBandits has organized hands on workshop on “Android App Development” on 22 nd and 23 rd September 2017, which was conducted by Mr. Shripal Jain, Android Developer of GFXBandits and Mr. Hemant Shah, Founder of GFXBandits and co-ordinated by Prof. Bhakti Sonawane and Prof. Karuna Borhade of Computer Engineering Department, SAKEC. 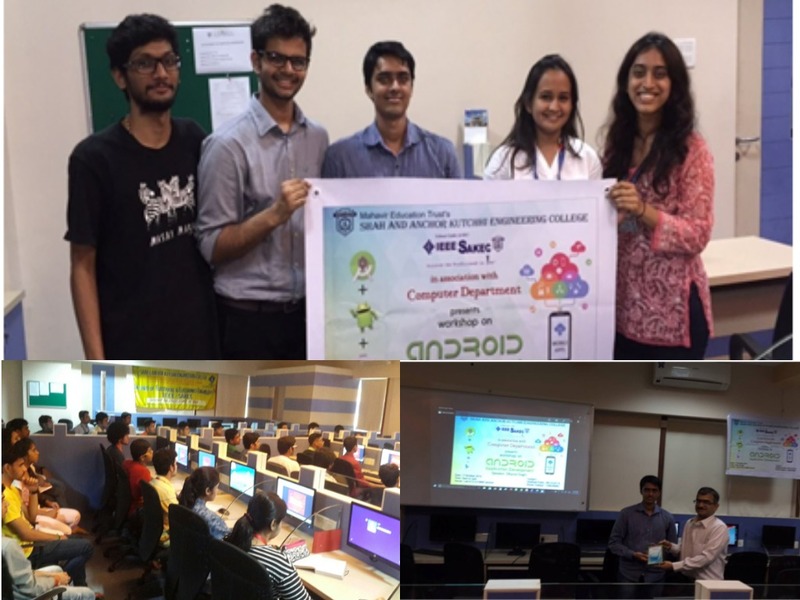 The event was attended by 59 participants, including students of SAKEC and other colleges, along with some industry professionals.The workshop was intended to familiarize participants with Android Studio software. Participants were trained to make applications using UI control and toasts, which can be launched in Google Play Store and are supported by various devices such as TVs, smart phones, tablets, camera, video game player, smart watches, car systems etc. They also learnt to post advertises in their app using JSON, thus making app as a source of revenue. 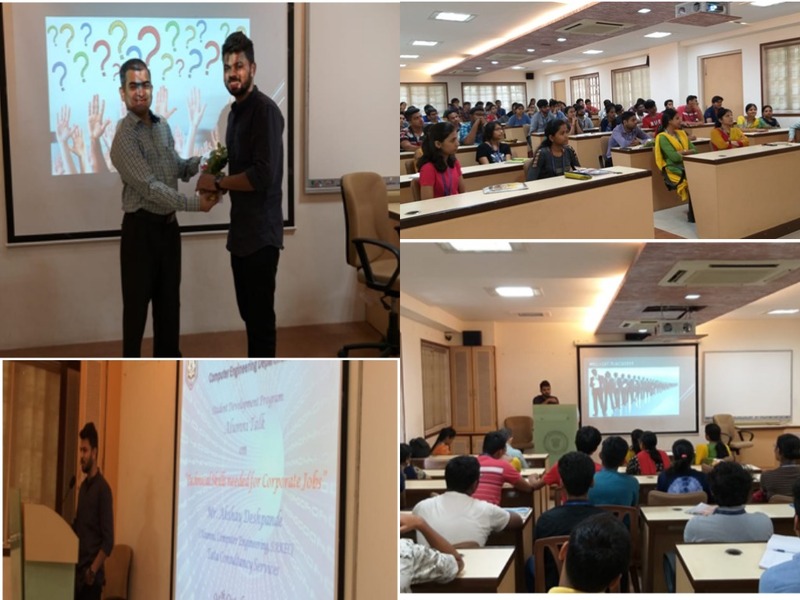 The session was interactive and was concluded with the valedictory function which was graced by Principal Dr. Bhavesh Patel, Computer Engineering Department HOD Prof. Uday Bhave, IT Department HOD Prof. Swati Nadkarni and CEO of GFXBandits Mr. Ronak Parikh. 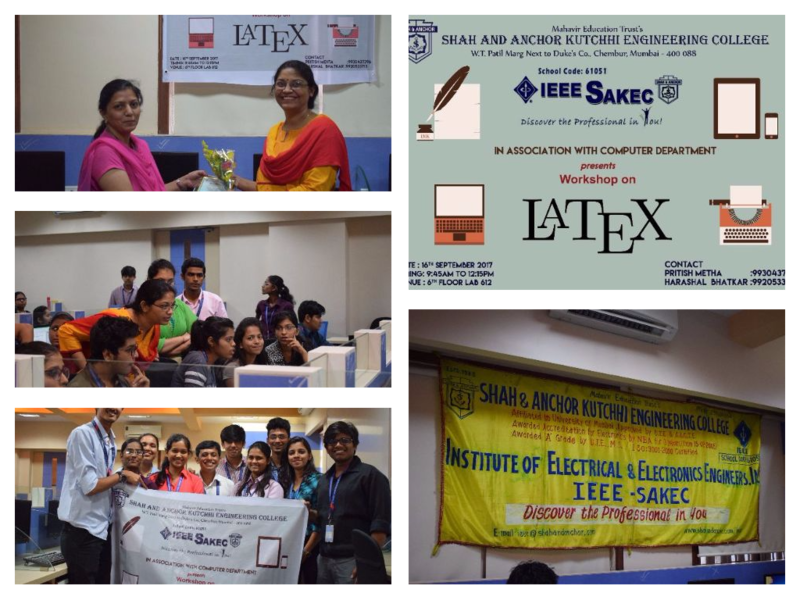 IEEE SAKEC in association with Computer Engineering Department of SAKEC has conducted a workshop on “Introduction to Latex” on 16 th August 2017. The Program was conducted for students of SAKEC and other colleges by Prof. Manimala Mahato. Along with her the event was co-ordinated by Prof. Shazia Sayyed.Latex is a software that is used for documentation and making reports. LATEX is preferable than MS Word because of the high typographical quality of the documents it can produce. Editing the document in LATEX is very easy compared to MS Word. In this workshop, topics related to LATEX including installation steps of the LATEX, familiarization of LATEX, different commands starting from basic to advanced, which is required to write a report in LATEX, is covered. 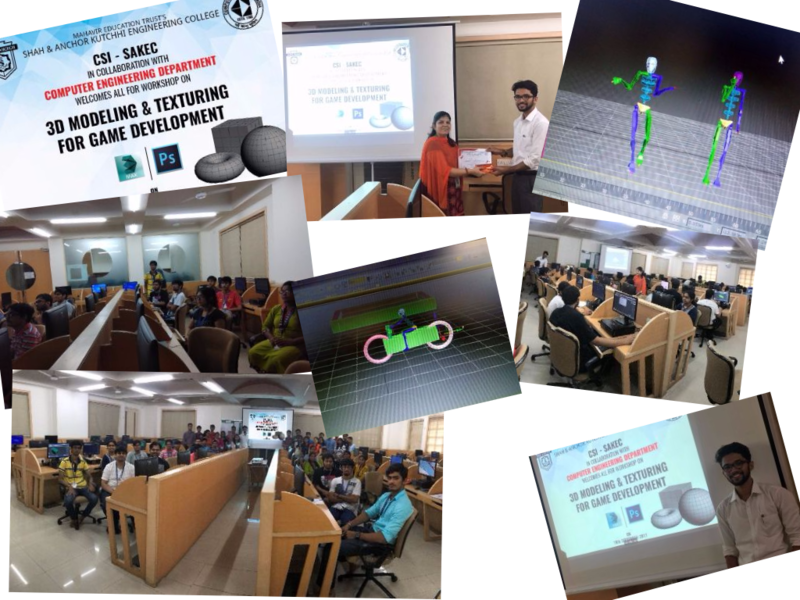 3D Modeling and Texturing for Game Development hands on workshop was organized by the CSI-SAKEC student branch in collaboration with Computer Engineering Department by Mr. Aadesh Khale along with CSI staff co-ordinator Prof. Deepshikha Chaturvedi and Computer Staff coordinator Prof. Vidyullata Devmane on 16th September 2017. 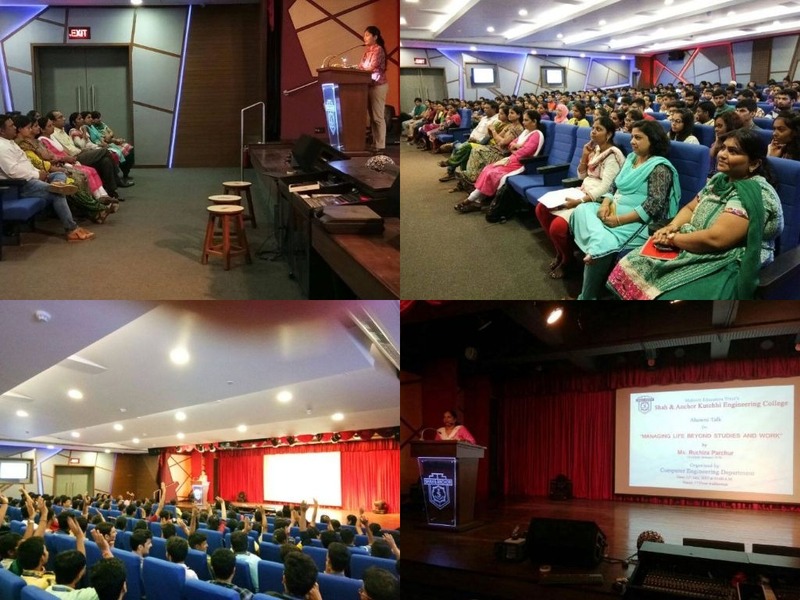 The event was attended by students of SAKEC and other colleges. 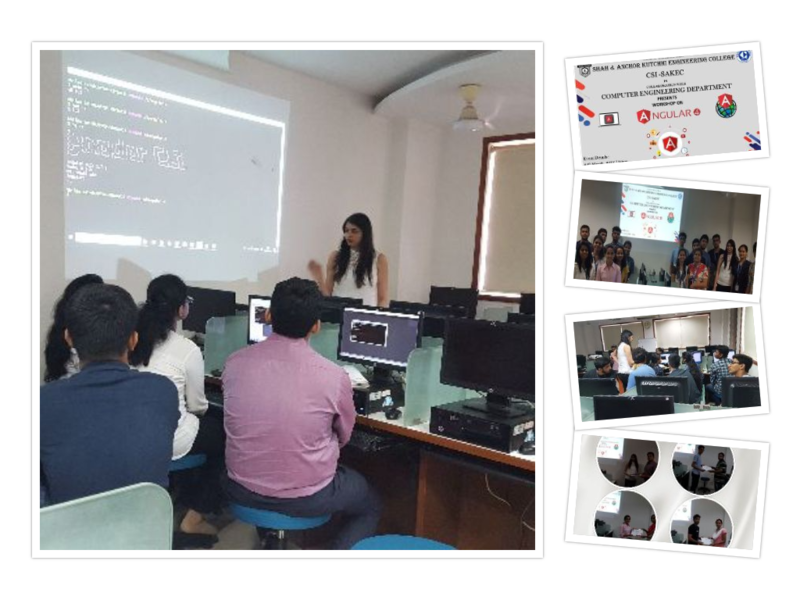 The main objective of the workshop was to get the students acquainted with the knowledge about Autodesk 3ds Max & Adobe Photoshop for Game Development. Participants were taught about different techniques which can also be used in other fields like Architecture, Film, and motion graphics. The session was very interactive and concluded with Question answer session. 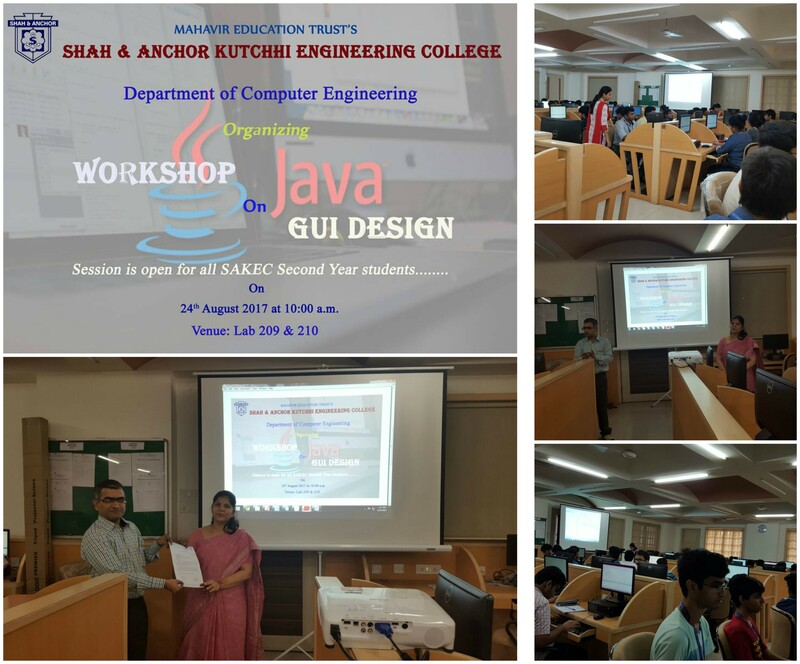 Computer Department of Shah and anchor Kuttchi Engineering College conducted an Alumni Talk on 13th July 2017. 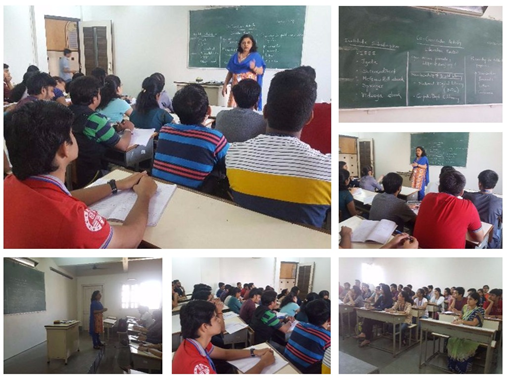 Ms. Ruchira Parchur was invited to Speak to the students on “Managing Life Beyond Studies & Work”. Ruchira is a health Believer, which is why she runs Marathons whenever she gets the chance and she encourages the students to do everything they have to take care of their heath. Grabbing Opportunities is something she knows about, because her career is all about it; she works as a technical writer at TCS. Advising the students; to take up every chance because she believes in the “Opportunity never knocks twice” philosophy. Time and tide waits for no man – Ruchira insisted that, the students should make use of the time appropriately by arranging their priorities. 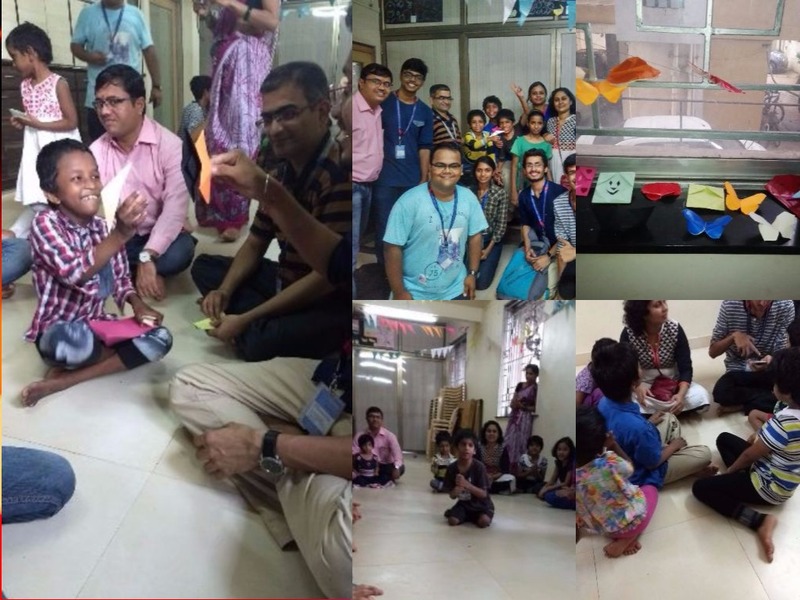 As a part of Institutes Social responsibility computer engineering departments faculties and students has visited Balanand Ashram, Chembur on 2nd September 2017. Ashram provides an environment that provides the child warmth, care and material comforts of a home and family until an adopting family is found. I/c Head of Department Prof. Uday Bhave, Prof. Amol Dhumal, Prof. Rupali Kale and Prof. Deepa Ekhande along with students has voluntarily visited the Ashram for social cause and interacted with children. Children looked so ecstatic and were participated in all the activities conducted by volunteers. 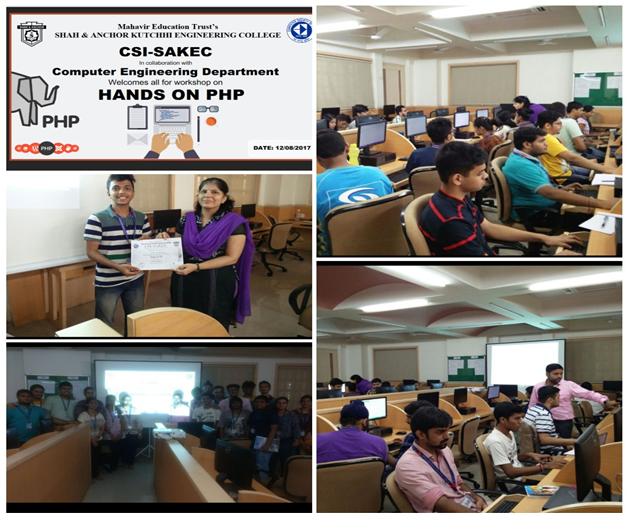 A workshop on “Hands-On-PHP” was conducted on 12th August 2017 by CSI SAKEC in collaboration with Computer Engineering department. Speaker for the session was Prof. Pradip Suresh Mane. He covered topics like Introduction to Web Technology, HTML and PHP concepts, Syntax of different fundamentals like Statements, displaying Data, Arrays, Looping and branching was covered, Database creation by using PHP myAdmin and the connectivity with the php pages, The complete concept was explained by using Login form where the User create an account and set password from using front end and the same was saved in database. The aim of this program was to learn PHP and its database connectivity so that the students are familiar with PHP and the web technology while doing their projects or any application. Theme of the session was “Designing your own website” using WordPress. Around 140 students have taken advantage of this opportunity by participating in this megaevent. Inauguration of event was done by Principal Dr.Bhavesh Patel and vice principal Dr.V.C. Kotak. Our speakers Mr.Vikramank Singh – Data Scientist at Facebook was a Keynote speaker for the event. 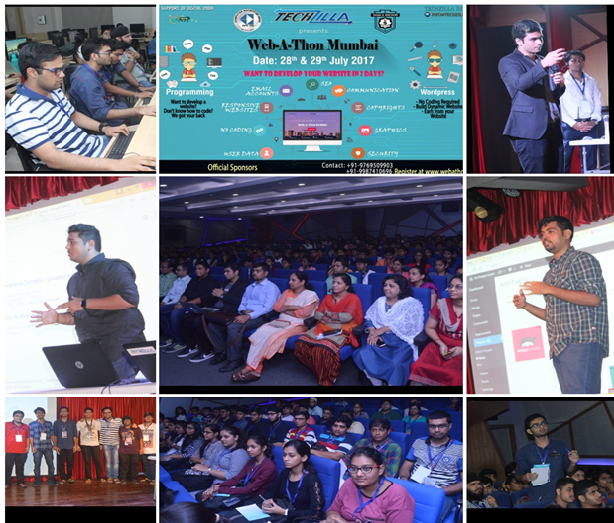 Mr. Neel Doshi, Founder & CEO of Techzilla and Mr. Rohan Immanuel, Development Head from Techzilla Infotech conducted the event. The workshop ended with great feedback from students. The students showed considerable interest in future workshops. Team of Durita Dalal, Richa Lomate, Smit Malde and Yash shah have successfully presented the project on ANDROID APPLICATION FOR INDIAN SIGN LANGUAGE TRANSLATOR and Team of Kinjal Savla,Piyush Sahu and Devang shah have successfully presented the project on ANDROID APPLICATION FOR ATTENDANCE SYSTEM USING FINGER PRINT SCANNER during Transform Maharashtra event showcase hours on 1st May 2017. The event was organized by Goverment of Maharashtra at National Sport Club of India, worli.. Dr. Vinit Kotak, Prof. Shikha Shrivastava, Prof. Vidyullata Devmane were present to encourage our Students. Department Congratulate our Project group for winning an Intra College Project Competition “Project Hunt” at SAKEC held on 21st April 2017. 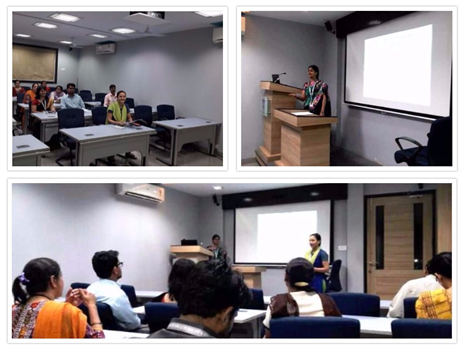 Tejas Deshpande, Aishwarya Iyer, Chinmay Ayeer, Jay Chheda have successfully presented project on “Security Guidance Using Virtual Reality “. Group was honoured by Dr. V.C.Kotak, Dr. Uma Rao, Prof. Vidyullata Devmane, Prof. Sujata Bhairnallykar (Saraswati College of Engineering). Department has celebrated success of two mega events of this semester- Pixel-Technology Conclave and Studying in US session by U.S. Consulate. Department congratulates and appreciated organizing student team, committee members and volunteers of the event for their extreme hard work. 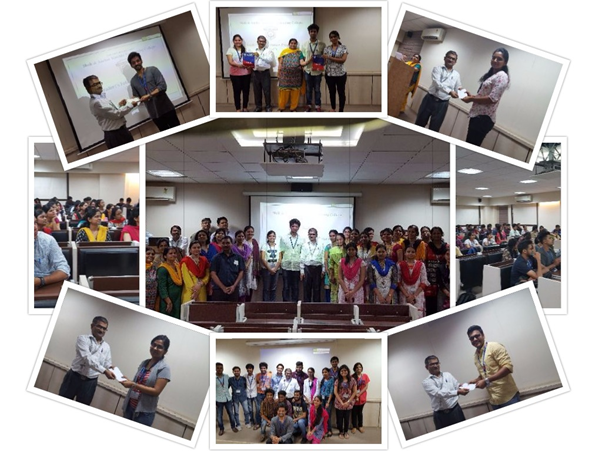 Student Appreciation program was held on 20th April 2017. I/c Head of the Department Prof. Uday Bhave and Prof. Vidyullata Devmane, Prof. Shazia Sayyad were present to encourage the Students. Also appreciation letters are given to Newsletter team for their absolute dedication. 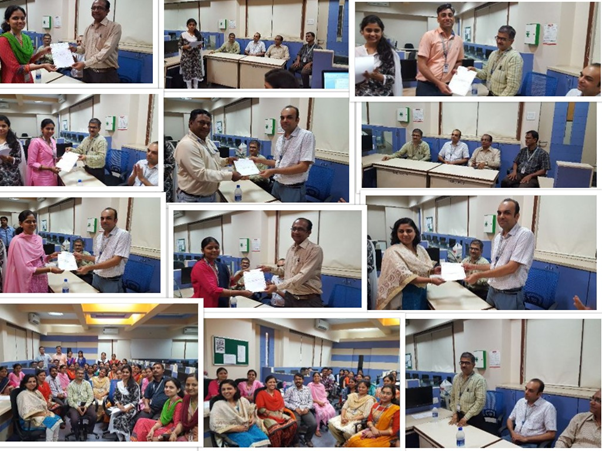 Department has organized a Staff Appreciation Function on 18th April 2017. Department has organized a session on “Cloud Computing” in collaboration with IEEE SAKEC on 1st April 2017 . 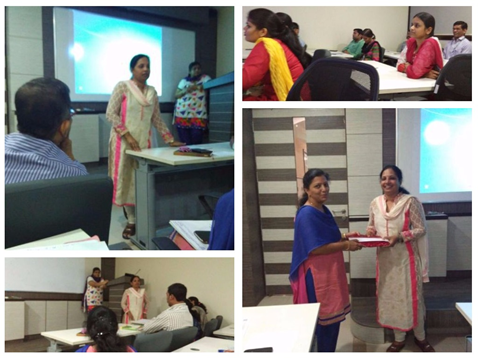 Session was conducted by Ms. Shital Joshi. Sr. System Administrator, Tata Consultancy Services. Department has organized Final year project Poster presentation for Third Year Computer students on 22-03-2017. Vice Principal Dr. V. C. Kotak and ISO Auditors Mr.M.B.Dave, Ms. Shruti K. & Mr. Nalin M. were present to encourage the Students. Department has organized Faculty Development Program on Digital Marketing on 18th March 2017. Session was conducted by Mr. Sunil Nalawade (Director of Media Sparkt). 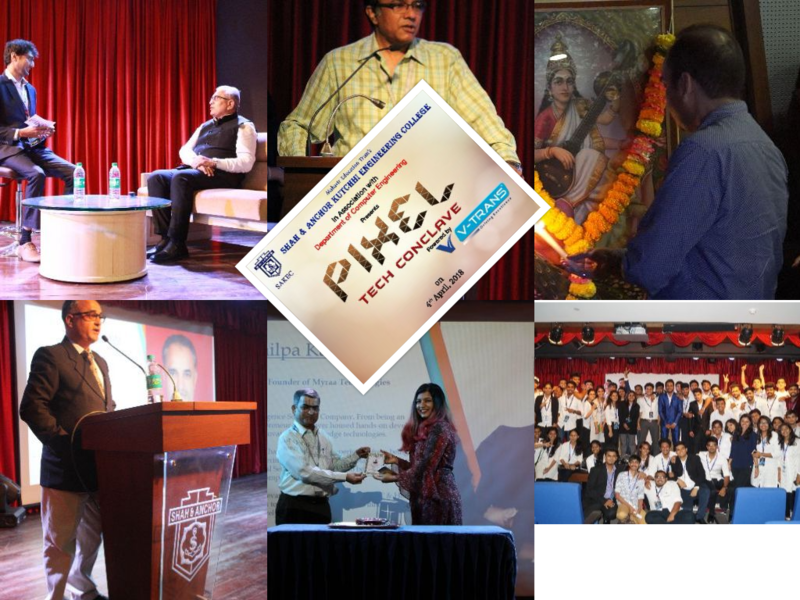 Department has organized PIXEL-The Technology Conclave on 17.03.2017. 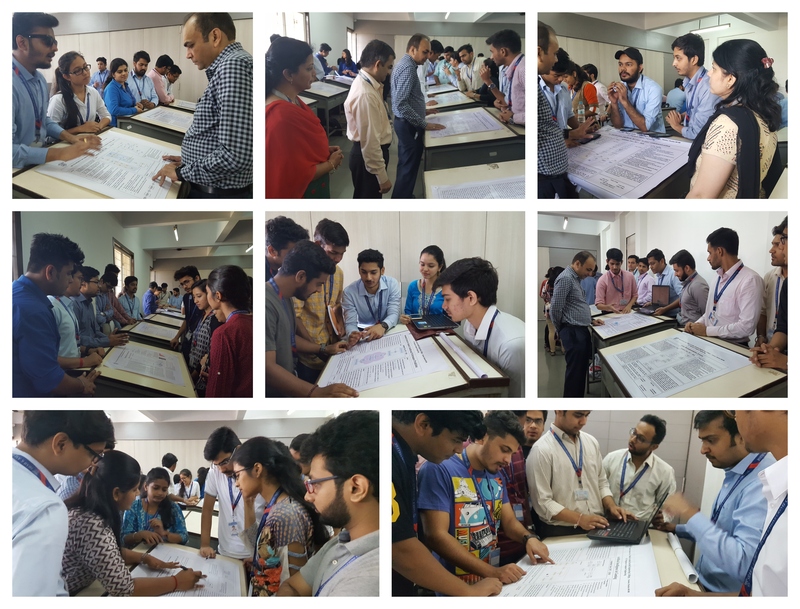 Staff and Students of different Engineering colleges of Mumbai and Navi Mumbai were participated in the event. Department has organized a session on “Studying In US And US VISA” for SAKEC Students, aspiring Higher Education in USA. Session was conducted by the members of The U.S. Consulate, Mumbai on 10.03.2017. NBA Presentation by Department was conducted on 4th March 2017. 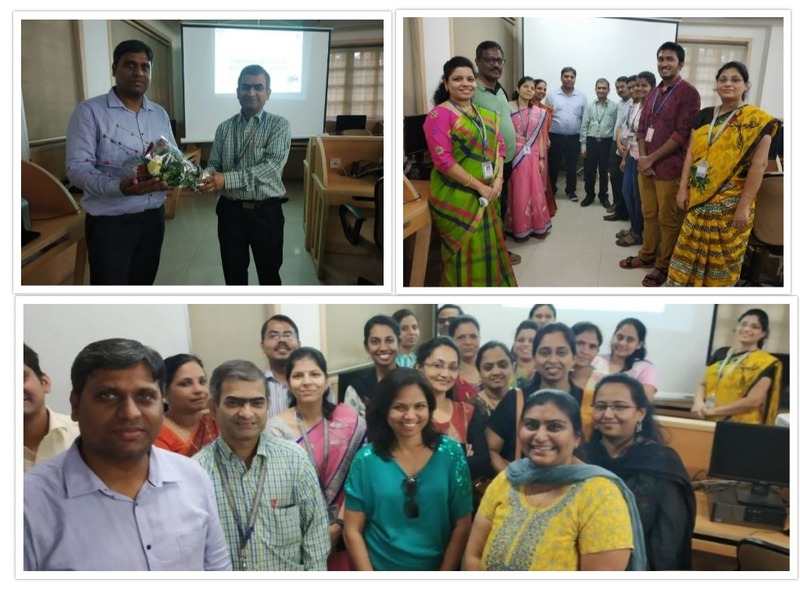 Department has organized a faculty development programme on “Machine Learning & It’s Applications In Image processing” by Dr. B. Krishna Mohan, Professor, CSRE, IIT Bombay on 05.03.2017. Final Year Project Poster Presentation was conducted by Department of Computer Engineering on 22-03-2017. Vice Principal Dr. V. C. Kotak and ISO Auditors Mr. M. B. Dave, Ms. Shruti K. & Mr. Nalin M. were present to encourage the Students. The posters of projects of different domains like Security, Mobile Communication, Big Data, Data Mining and Networks etc., were displayed. 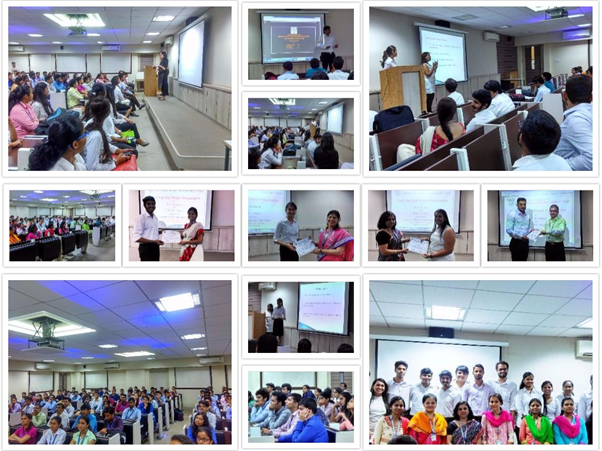 Best project presentation By 2015-2016 Batch was organized by Department for 2016-17 batch students on 23rd Feb 2017. 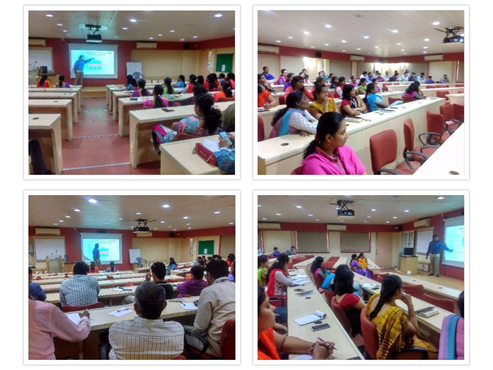 Department has organized a faculty development program on “Teaching Technology and the Tools” on 15th February 2017. Session was conducted by Prof. Rekha Ramesh. Department had organized a session on “GATE Awareness” on 9th February 2017 for Third Year Students. Session was conducted by Prof. Shashikant Radke. Department had organized a faculty development program on ” Role of IT in Aviation” on 4th February 2017. 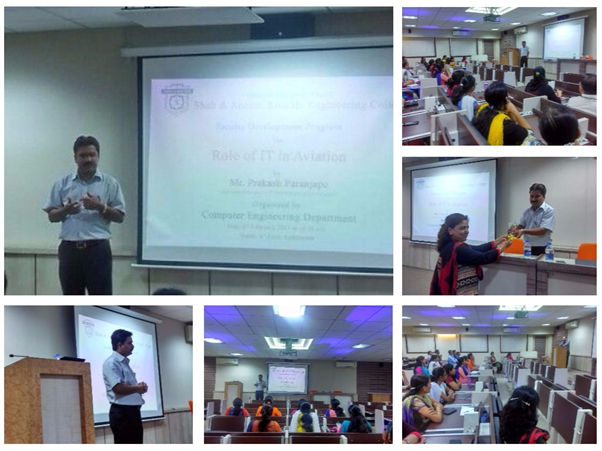 Session was conducted by Mr. Prakash Paranjape, Assistant Manager, IT Department, Jet Airways. Department had organized a faculty development program on ” Basics of Patenting and Intellactual Property” on 4th February 2017. Session was conducted by Mr. Pinkesh Jain , Dy. Controller of Patents & Designs, Patent Office, Govt. Of India. Falicitation of our NPTEL Gold Medalist – Vivek Gawande (S.E.Computer) on 4th February 2017. Department had organized a special session on “Literature Survey” on 2nd February 2017 for Third Year Students. Session was conducted by Prof. Vidyullata Devmane. Department had organized a Workshop on Android in collaboration with CSI-SAKEC on 21st January 2017. 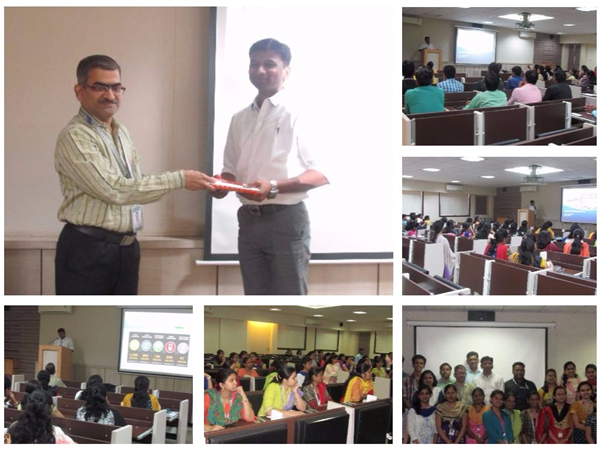 Session was conducted by Salil Deshpande, Masni Mehta. IEEE SAKEC in association with Department of Computer Engineering has organized a workshop on” Android App development”. 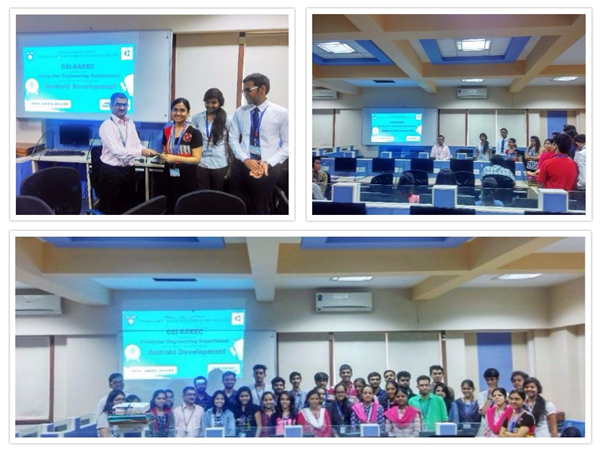 The session was conducted on 1st October 2016 by Mr. Dhaval Gogri. The speaker introduced the 4 main components of Android Activities, Services, Broadcast Receivers and content providers. He also mentioned some additional components like fragments, layouts, views, etc. After that the participants were introduced with the basic concepts of Android Studio features and then the first hands on application on How to add two numbers was taken. Department had organized a faculty development program on ” Faculty Diary Writing” on 21st January 2017 for new faculties. Session was conducted by Prof. Pinky Vishwakarma. 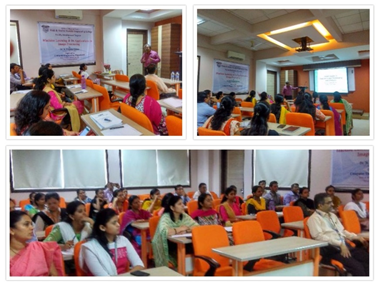 Workshop on “NBA Awareness” was conducted for all the department on 21st January by Prof. Atul Kachare.